If you scanned the recipe page of this blog, you might be led to believe that I was vegetarian. But I’m not, at least not technically. Though I’ve been meat-free for almost three years now I do occasionally eat seafood, so the term “pescetarian” more accurately describes my eating practices. Generally though, I prefer to use the term vegetarian for a couple reasons- first of all, many people have no idea what a Pescetarian is, and secondly, it’s terribly pretentious-sounding, don’t you think? Then, of course, there are the Judges. I’m often embarrassed to even admit that I eat seafood, lest I’m faced with the dreaded “Why? Don’t you think fish have feelings?” or “I guess fish don’t count as animals to you because they’re not cute”. Here we go. I don’t get caught up in these conversations because my reasons for eating seafood are hardly better than a lack of cuteness: I like it and think I’d miss it too much if I gave it up. For me, giving up meat was easy, but I’m not sure giving up fish would be. That said, I don’t eat seafood very often, and fresh seafood even less so. Maybe the hardest fish for me to give up (and I’m not gonna try) would be anchovies; these salty little fillets add a savoury kick to sauces and pasta dishes that I just adore. It’s surprising, then, that until recently I’d never tried their close cousin, sardines. Long-known to be a “brain food” and rich in omega-3 fatty acids, canned sardines are also, as I’ve recently discovered, wicked good. This recipe, which comes from an old Mark Bittman column, is one of those great “pantry standbys”. You probably have many of the things needed to make it – pasta, sardines, capers, breadcrumbs – in your cupboards right now, and the others – lemon, parsley – in your fridge. The genius of it, aside from the possible effects of the sardines (ha, ha), is in the breadcrumbs; they coat the pasta and somehow corral all the other ingredients into a sauce. Moreover, it’s quick to make, filling, and defies the need to shop much. And of course, it’s tasty. And isn’t that the best reason for eating something? Put a large pot of water on to boil and cook pasta until al dente, according to package instructions. Meanwhile, heat a glug of olive oil in a nonstick pan over high heat. Add the breadcrumbs and cook until toasted and lightly golden, 3-4 minutes. Remove breadcrumbs to a bowl (they will burn if you leave them in the pan) and season lightly with salt and pepper. Heat a bit more olive oil in a larger pan over medium heat. Add the shallots and garlic and cook gently until soft and translucent; about 5 minutes. Add the lemon zest, lemon juice, sardines and capers and continue cooking until everything is warmed through. When the pasta is done, drain (reserving about 1 cup of the cooking water) and add to the pan with the sardine mixture. Toss well, adding in the breadcrumbs and parsley, as well as any cooking water needed to moisten. Serve immediately. As a fellow pescetarian, I totally agree with you about use of the term! My choices regarding what I eat are so complex, and explaining them to others hasn’t often been fun since I was a hell-raising teenager. 😉 The recipe sounds perfect. I tried a similar one (can’t recall the source), but it ended up having waaaay too many bread crumbs that gave it an odd mouth-feel. I ought to give this one a shot! Thank you – I am right there with you on the pescetarian thing. I just say I’m vegetarian for simplicity’s sake. I hate it when people question it and it becomes a conversation topic. I don’t berate others about why they eat meat, after all. Besides, I love sushi far too much to give it up. Although I have been cutting back and trying to stick to the Monterey Bay Aquarium’s recommended seafood list. Oh this post could have come out of my mouth! Anchovies, especially, in the form of fish sauce,make me unable to be a complete vegetarian. Fish sauce has many uses and zero substitute. Lately, I too, have been getting into sardines. Sardines on lightly toasted homemade wheat bread with slices of a perfectly ripe avocado? Delicious. Try it and you’ll see. and this recipe is on the docket for next week! Nicely done! Looks absolutely delicious. I tried it, because it is the end of the month, and I am trying to save money until the next pay check. Amazing. A great meal. With a bottle of wine, wow! This has been one of the finest impromptu meals I have done so thanks v much. Used sardines in tomato sauce as that is what was at the back of the cupboard – added a few fresh cherry tomatoes as well and it was delicious – almost like lobster. My 4 year old devoured it which is always the litmus test. Definitely goes in my recipe book this one. 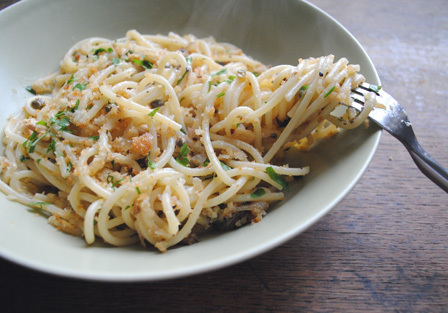 I am making this for dinner again tonight, with the addition of a couple of anchovies, just for an extra fishy kick. Will let you know how it is. I always use canned tuna to cook pasta, but never try to use sardine. Think that it is very similar, both simple and fast to cook. Will try sardine next time. Caveat to those of us who don’t read thoroughly and carefully: in the last step “drain (reserving about 1 cup of the cooking water) and add to the pan with the sardine mixture” does NOT mean to add 1 cup of cooked pasta water to the pan. It means add the PASTA to the pan and then IF needed more moisture after everything is mixed together, add some of the reserved water. I sadly ruined it this way last night. Otherwise, I think this would have been a pretty tasty dish. I actually think there’s no way you need even close to 1 cup of water. I’m sure a tablespoon would’ve been plenty.